Designed to protect the hands when working with harsh chemicals, the Ansell Barrier 02-100 Five-Layer Ergonomic Gloves are ideal for providing hand protection for a wide range of industries. 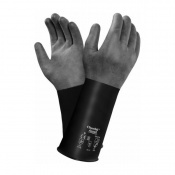 They feature a gauntlet-style cuff to improve protection of the wrists, and provide improved comfort with an ergonomic design. The product code for the gauntlet gloves is: 02-100. When working in environments where harsh chemicals are present, it is paramount to ensure that the hands are sufficiently protected. 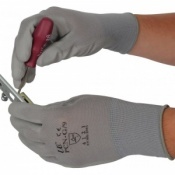 The Barrier 02-100 Gloves protect hands and wrists when handling and working with a multitude of chemicals, while also offering a comfortable fit with a hand-specific ergonomic design. For detailed information about the permeation breakthrough times of the gloves according to EN 374-3:2003, please view the PDF below. 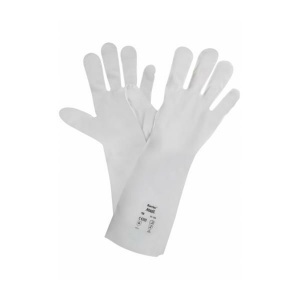 The Ansell Barrier 02-100 Gloves are available in a choice of sizes, making them suitable for most users. Please consult the table below for details, then select the required size from the drop-down menu at the top of the page. 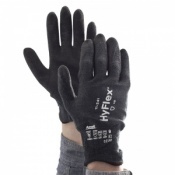 The gloves have a thickness of 0.062mm and a length of 380mm to 410mm.